When it comes to open handed drumming mastery, Rayford Griffin is among the very best I have ever seen. 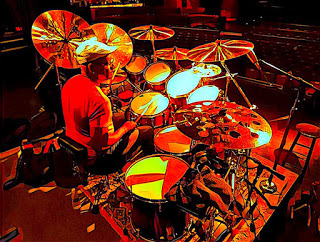 Proponents of that "left-handed" technique include the legendary drummers Lenny White, Simon Phillips and of course, Billy Cobham. I was taught to play open handed by the great Paul Sears after seeing the Mahavishnu Orchestra with Cobham. I immediately knew that I wanted to learn how to play drums like that. 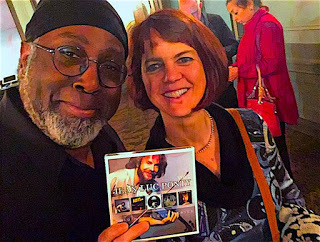 Last June, I was able to catch violinist Jean-Luc Ponty's recent "The Atlantic Years Tour", reuniting him with guitarist Jamie Glaser, keyboardist Wally Minko, bassist Baron Browne and of course Rayford Griffin. A few months earlier I saw this line-up in support of the "Anderson-Ponty Band", featuring the founding member and lead vocalist of Yes, Jon Anderson. As much as I enjoyed it, I longed to see the Ponty group performing their all-instrumental material. This most recent tour didn't disappoint. For this tour, Griffin added an addition bass drum and another rack tom. However, unlike his double bass drum set-ups of earlier years, Griffin chose an asymmetrical approach, akin to the set-ups currently used by Billy Cobham. 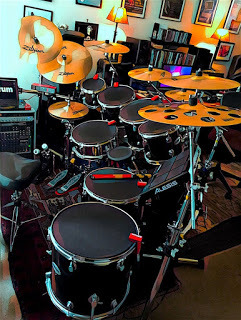 His set-up featured the higher tuned rack toms on both ends, with the middle rack toms in their normal place; a sort of "high-mid-low-higher" arrangement. I'd been experimenting with Cobham's set-up for quite a bit, so it wasn't difficult for me to put it into practice right away. Cobham described his set-up as a "tonal array"; which also avoided the so-called clichéd tom fills. 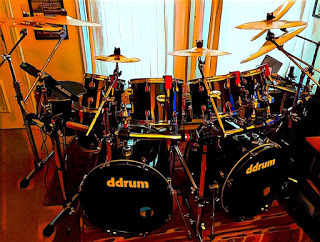 Truth be told, Cobham's arrangement of "lower-mid-low-high-higher" rack toms were a bit of a challenge at times, and I often found myself reverting to the trusty, conventional rack tom arrangement of most drummers, including Simon Phillips, "highest-higher-mid-low-lower-lowest". There's nothing like the sound of cascading tom fills! Having seen Cobham many times with that set-up, I was curious to see and hear how Griffin would approach it on his kit. 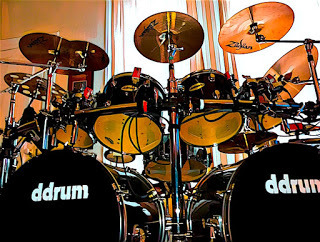 Like Cobham, Griffin used the middle rack toms and his floor toms for all of the regular drum fills. Cobham however has his lowest rack tom placed next to his ride cymbal, and would often roll from the outside toms inward, creating very cool fills; (Phillips also uses that quite a bit as well). Griffin appeared to play many of his tom fills in sets of three; the first three rack toms, and the fourth rack tom with his two floor toms. The result was very, very cool and I decided to try it myself. One of the things that helped me to become a strong chess player was to immerse myself into the repertoires of the great chess grandmasters. By playing over their games and using their openings, I would get a better feel for how they thought, solved problems and thematic nuances. Drumming has been the same for me. I'd listen to all kinds of drummers, but I paid particular interest to the open handed players and how they approached music. To get into the mind of Rayford Griffin and his work with Ponty in particular, I added an identical Paiste PSTX 18" cymbal for my live Yamaha kit, and an 18" Sabian B8 Pro O-Zone cymbal for my Ddrum home kit. After practicing along to bits and pieces of Ponty's tunes like "Tender Memories", "Jig", and "Cosmic Messenger", I turned my attention to the music I'm currently performing and recording with keyboardist Steve McQuarry's electric quartet "Echelon", featuring violinist Michele Walther and bassist Ted Burik. My musical adventures with this latest set-up will continue; I'm going to be trying it out on my Yamaha kit when I get back to the studio with Echelon later this month. At home, I'll continue tweaking, practicing and creating as much as I can on my customized, hybrid acoustic-electric Ddrum kit, a virtual duplicate of the Yamaha kit I used for the the road, which features internal Pintech triggers, a Gibraltar rack, Zildjian & Paiste cymbals, an Alesis DM 10, and another MacBook full of samples. The Alesis SamplePad Pro is the only equipment I have to bring with me. aScript i f it is disabled in your browser.